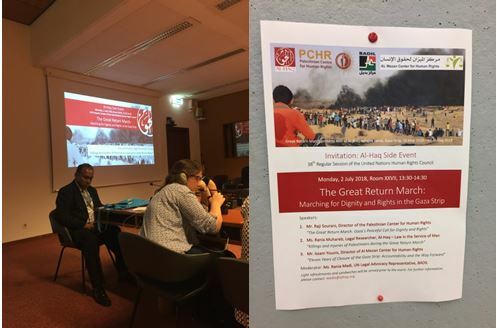 On the sidelines of the UNHRC session, Palestinian NGOs and the Palestinian Authority (PA) hosted highly inflammatory events about the violence along the Israel-Gaza border. The accusations of Israeli wrongdoing went far beyond anything featured in mainstream media. Notably, three of the NGOs that spoke at and/or hosted events – Addameer, Palestinian Return Centre (PRC), and Al-Haq – have close ties to Palestinian terror groups. While the NGOs funding information is not transparent, NGO Monitor has identified direct and indirect funding to Al-Haq and Addameer from European governments, including 2014-2017 grants from Denmark, Sweden, Switzerland, and the Netherlands via the Human Rights and International Humanitarian Law Secretariat (Secretariat). David Deutch, Addameer (funded by the Secretariat, Ireland (Irish Aid), Norway, Christian Aid, (UK), among others). Rania Muhareb, Legal Researcher, Al-Haq (received funding from the Secretariat and is part of a German Ministry for Economic Cooperation and Development project). Stated that there is no way for victims to pursue justice through the system and that the only way is through international mechanisms. He furthered that the ICC is the mechanism that should look into violations. Rania Madi, UN Legal Advocacy Representative, BADIL (moderated event) (received funding from the Secretariat, DanChurchAid (Denmark), and Trocaire (Ireland). In response to a question regarding the fact that Hamas and Palestinian Islamic Jihad had claimed the majority of those killed as their own combatants, Madi claimed, “people under occupation have the right to use all measures to end occupation, even using arms” (emphasis added). Referred to Hasan Yousef spending 14 years in prison and 7 in administrative detention. Hasan Yousef is a senior Hamas official. Referred to alleged psychological ill treatment stemming from administrative detention. Called for all individuals in administrative detention to be promptly charged or released. Referred to the psychological effects on administrative detainees. Quoted extensively from The Wall and the Gate, a book by NGO attorney Michael Sfard. It is highly improper that UN officials participated in and provided a UN-imprimatur to this propaganda event. Accused Israel of destroying schools and hospitals in Gaza. Called for an end to the blockade of Gaza, compensation for those affected by the blockade, ending all forms of “apartheid practices,” and for refugees to return to their homes. Utilized “the map that lies” in her slideshow of a “shrinking Palestine”. Stated that under Israeli law “incitement can be punishable but what is incitement? It is hard to define” (emphasis added). Called out NGO Monitor’s speech before the Council (condescendingly and offensively referring to our staffer as a “girl”), which highlighted virulently antisemitic incidents and remarks committed by the PA and programs it supports. 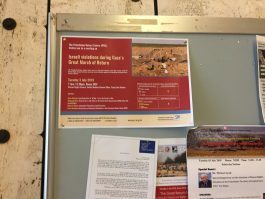 She stated that “I was in the Council today for Item 9 and one girl was talking on behalf of Israel, one NGO, and actually what she did was defame Palestinians and decry EU funds” (emphasis added). Claimed that the IDF is using “expanding bullets” leading to “permanent damage.” Argued that Israel was also using “toxic gas” against Palestinians at the Gaza border. His presentation focused on the claim that an occupier can become an illegal occupant. Argued that there should be a commission created to do a comprehensive study on the legality of Israel’s occupation and then consider the advantages of an advisory opinion. 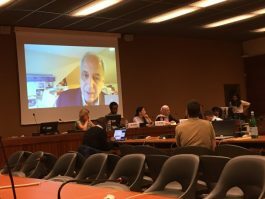 In response to a question about what the international community can do to bring the occupation to an end, Lynk stated that “there are a number of robust tools at the hands of the international to do this. It may mean reviewing or suspending Israel’s privileges as a state member at the United Nations. It may mean that countries in the world particularly those with significant trade or political relationships with Israel would review their relationships with Israel in the military, political, diplomatic, and economic investment spheres. And that Israel would face some forms of restrictions in its abilities to wind up trading” (emphasis added). In reference to a question regarding the “territory,” Lynk stated that “It is up to the Israelis and Palestinians to find a way to live together peacefully and harmoniously in equality and in justice and that could involve a variety of different political solutions for how they want to live together. I am not here to prejudge what should or could be done with respect to their political future together but it has to be one based on mutual respect and quality…” (emphasis added). Stated that “if you are going to make peaceful transitions to justice impossible you are going to make violent reactions to oppression inevitable” (emphasis added). Claimed that Israel is using “expanding bullets” causing severe injuries. However, the company that produces the bullets in question has already stated that the IDF does not use these types of bullets. Furthermore, the image shown in the slide presentation compares a shrapnel injury to that of a bullet injury, not a regular bullet to an expanding bullet as Muhareb claimed. 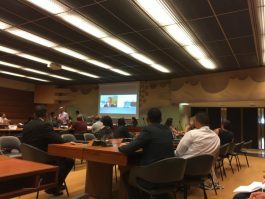 Quoted Human Rights Watch and Amnesty International as NGO experts in order to justify BDS campaigns against Israel. Accused Israel of using explosive bullets, using the same falsified picture (see above). Argued that “it appears that there is a deliberate intention to further complicate injuries of protestors targeted or near the fence, hindering their ability to advance towards the fence” (emphasis added). Referred to the diminishing “moral and hope” of people in Gaza.